About 30 community members gathered this evening at Amundsen High School to weigh-in on the proposed change to make West Argyle Street a two-way street between North Damen Avenue and North Wolcott Avenue. The street is currently a one-way heading west from Wolcott to Damen. Neighbors file in. About half by a show of hands said they live on West Argyle. Neighbors heard from a representative of the developers of Ravenswood Terrace, 40th Ward Alderman Pat O'Connor and a traffic engineer from the City. Long story short: It was made clear that the proposal for a two-way street at Argyle was from the development company to make automobile travel and access to the entrance of Ravenswood Terrace easier. This would prove more attractive to potential tenants than having to drive in a circular fashion to get to the east bound portion of Argyle. The only way in to the Ravenswood Terrace development now would be to take south bound Wolcott to Argyle. The City's traffic study showed the best solution to the development access problem was to make Argyle a two-way street. It was verified that Argyle met technical standards for a two-way street and it's safer and less stressful on traffic to have a direct line of travel than to drive around the block. A typical driver now would have to drive North on Damen, turn right on Winnemac (which is a busy park intersection), turn right on Wolcott and then left on Argyle, thus, passing through many extra intersections. 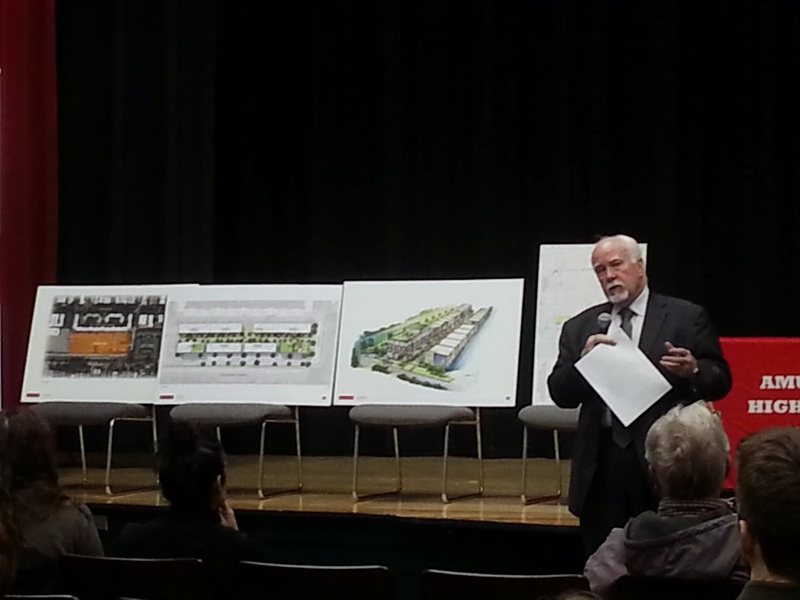 Alderman O'Connor addresses the community meeting this evening in Amundsen's auditorium. The two-way proposal was rejected for now on the basis of two major reasons: 1) Argyle seems too narrow (despite is being the same size as West Winnemac) to have two-way traffic. It was felt that cars would have no way to "move over" to make room to pass each other. It would jam up. And 2) Neighbors are weary of potential "cut through" traffic from the new Mariano's and L.A. Fitness developments in addition to the new residential apartments. Mr. O'Connor agreed to shelve the proposal and re-visit it down the road when all the development is completed and it is then shown that the need for a two-way at Argyle is critical. It was great seeing some familiar faces this evening and really good to meet some new (new to me) neighbors. 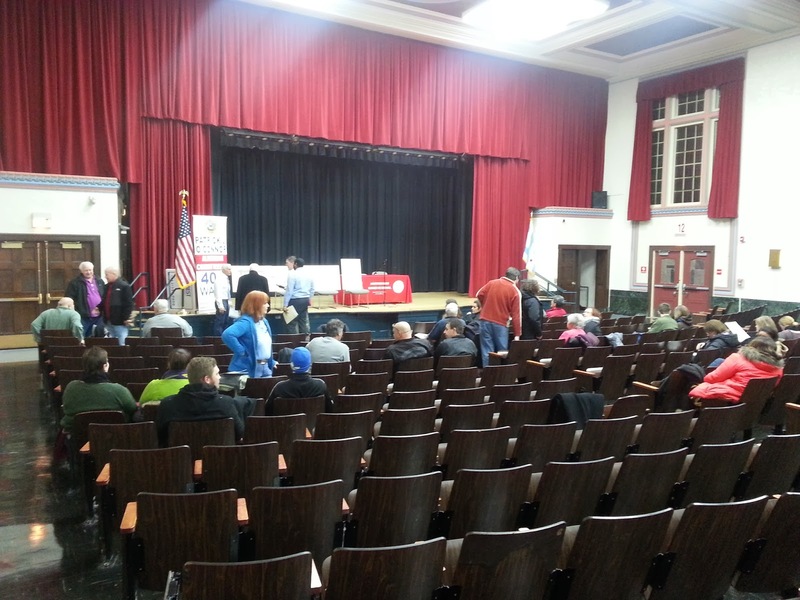 A big thanks to Amundsen High School for once again making the facility available for public meetings without hesitation.